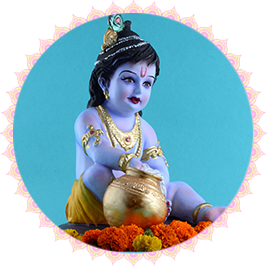 Krishna Jayanthi marks the birth of Lord Krishna, the ninth incarnation of Lord Vishnu. Lord Krishna was born on the 8th day of the waning Moon Period (Krishna Paksha) in the month of Aavani or Shravana (Mid-Aug to Mid-Sep) when the ruling Nakshatra (star) of the day was Rohini. Lord Krishna was born during the Dwapara Yuga (third epoch) around 5000 years ago to destroy Adharma (iniquity) and impart righteousness in the world. The birth of Lord Krishna personifies hope and his birth brought in hope for the humanity, which was suffering until then. Lord Krishna was born during the midnight when it was dark, and once he was born, darkness began to fade slowly. Here, darkness symbolizes the obscurity that engulfs your heart with fear, doubt, ego, angst, and anxiety. Upon praying to the Lord, these dark elements are vanquished, thus purifying your inner self and rays of everlasting hope flows in. Lord Krishna is the God of love and happiness, who is known for his blessings for a blissful life. Worshipping Krishna on his birthday shall also bestow numerous benefits including success in relationships and attainment of Moksha (liberation). It is believed that Lord Krishna reciprocates the love and devotion offered by his devotees. Lord Krishna was born as the eighth son of Vasudev and Devaki. Devaki’s tyrant brother King Kamsa was told by a divine voice that the eighth son of his sister Devaki would kill him. Hence, he jailed his sister and her husband and killed their seven children once they were born. When the eighth son was born, Vasudev secretly carried the baby to Gokul across the Yamuna River and exchanged him with a baby girl, born to a cowherd couple, Nanda and Yashodha. When Kamsa arrived to kill the infant, the baby girl appeared as Goddess Durga and informed him that his death had already reached his kingdom. Lord Krishna grew up as a cow herder in Gokul and later killed King Kamsa, which denotes the destruction of evil forces by the divine Lord. Krishna Jayanthi is widely celebrated in different forms across the country. Grand celebrations are held in states such as Gujarat, Maharashtra, Orissa and Uttar Pradesh. In Maharashtra, people celebrate Dahi Handi, when people form a huge human pyramid to break open a hung earthen pot filled with buttermilk; the winners of the game are rewarded with worthy prizes. In Jammu, kite flying is organized on this special day. Generally, people keep fasting throughout the day and break their fast by offering special Poojas to Lord Krishna in the late evening after sunset. Various delicacies are offered to the beloved God, decorated with jewels and flower garlands. Parents enjoy the occasion by dressing up their little ones like baby Krishna. In South India, little footprints made out of rice flour are drawn from the doorstep until the Pooja area, denoting the arrival of the Lord to their houses. Certain Vishnu temples also grace the occasion by reading verses from the sacred Vedic text – Bhagavad Gita. Fasting on this auspicious day can help you control your senses, which in turn help in the manifestation of God in one’s mind, cleanse your system and act as a divine tool to destroy your apprehensions and ego.